A statue of Our Lady with a miraculous origin. It stands about 16 inches high, the head is made of baked clay covered with a polished coat of fine white powder, possibly rice paste, and until recently was covered with several layers of paint. She stands on a moon that has silver clouds at either end and three golden-winged cherubs beneath it. She cradles the Christ Child in her left arm, and holds a gold crucifix in her right. The Child raises one hand in blessing, and in the other hand he holds a golden globe. The image's original robes were white, but as usual, the figure is covered by a heavy ornate cloak with gold and silver embroidery, including the Cuban national shield. It hides the body and gives the statue a triangular shape. Around 1608 two brothers, Rodrigo and Juan de Hoyos, and a ten-year-old slave boy named Juan Moreno, left Santiago del Prado (modern El Cobre, named after the copper mines), Cuba in search of salt to preserve meat for the copper miners. Halfway across the Bay of Nipe they put in for the night to wait out a strong storm. The next morning a small white bundle floated across the water toward them. It turned out to be the statue of Our Lady. It was attached to a board, was completely dry, and bore the inscription I am the Virgin of Charity. A shrine was built immediately, and instantly became a pilgrimage destination. At the request of the veterans of the War of Independence, Our Lady of Charity was declared the patroness of Cuba by Pope Benedict XV in 1916. Then image was solemnly crowned in the Eucharistic Congress at Santiago de Cuba in 1936. Pope Paul VI raised her sanctuary to a basilica in 1977. Pope John Paul II solemnly crowned her again in 1998. Son of Aloazo Tomas Garcia, a miller, and Lucia Martinez. He grew up in Villanova, Spain, and was educated at the University of Alcala. Professor of arts, logic and philosophy at the university from 1514. Joined the Augustinian friars at Salamanca, Spain in 1516. Ordained in 1518, celebrating his first Mass on Christmas Day that year. Suffered from absentmindedness and poor memory. Preacher. Prior. Provincial of the friars. Sent the first Augustinians to the New World. Nominated by the emperor to the archbishopric of Granada, Spain; he refused the first time, but agreed the second time it was offered, after being ordered to do so by the Pope; he took over on 1 January 1545. His cathedral gave Thomas money to furnish his house; he donated it to a hospital, saying, "What does a poor friar like myself want with furniture?" Every day he wore the same habit he had received as a novitiate, mending it himself. The canons and domestics were ashamed of him, but could not change him. Several hundred poor came to Thomas' door each morning, and were given meals, wine and money. Criticized for being exploited, he replied, "If there are people who refuse to work, that is for the authorities to deal with. My duty is to assist and relieve those who come to my door." He took in orphans, and paid his servants for every deserted child they brought to him. He encouraged the wealthy to imitate his example. Criticized for being gentle with sinners, he said, "Let them ask if Augustine or John Chrysostom used anathemas and excommunication to stop drunkenness and blasphemy." As he lay dying, Thomas commanded that all his money be distributed to the poor. Mass was said in his presence, and after Communion he breathed his last, reciting: "Into your hands, O Lord, I commend my spirit." Left a number of theological writings. Son of Waldegiso, who may have died when Corbinian was an infant. Nothing else is known of his youth. Hermit for fourteen years in a cell near the church of Saint-Germain in Châtres, France. His reputation for holiness, as a miracle worker, and as a spiritual director soon spread. Students were attracted to him, and he formed a community for them, but directing them took him away from his life of prayer. He wanted to return to the live of a hermit, and since he had a personal devotion to Saint Peter the Apostle, he moved to Rome, Italy. There he asked for the blessing of Pope Saint Gregory II. Gregory realized that Corbinian should not hide his talents, and ordained him as a missionary bishop to Bavaria (in modern Germany) where he would be supported by Duke Grimoald. He established his base in Freising, and made many converts throughout the region. Spiritual teacher of Saint Arbeo of Freising. When Corbinian denounced the incestuous marriage of Duke Grimoald to Biltrudis, the nobility turned against him, and Biltrudis even conspired to have him killed. Corbinian fled to Meran, Italy until Grimoald was killed in battle and Biltrudis carried off by the Franks; he then returned to Bavaria and resumed the mission that occupied the rest of his life. Son of Syrian immigrants. Educated at Palermo, Italy. Ordained in Rome, Italy. Canon regular of Saint John Lateran. First named cardinal-priest of Saint Susanna by Pope Leo II. Elected pope on 15 December 687, chosen over the priest Theodore and the archdeacon Paschal who was later found to be dabbling in magic and stripped of his position. Emperor Justinian II felt that his authority extended to all matters, including the Church. Sergius refused to lend papal approval to edicts issued by Justinian and the Synod of Trullan in 692, which Justinian had convened. The emperor ordered the arrest of the pope, but the citizens of Rome arose to defend him. When additional troops arrived, fighting broke out. Zachary, leader of the Emperor's troops, was forced to seek sanctuary and the protection of Sergius, was eventually reduced to hiding under the Pope's bed. Sergius ordered a complete halt to the violence; many of the troops sent to arrest him sided with the pope, and Zachary and his remaining soldiers were permitted to withdraw. Islam made large advances in North Africa during Serius's reign, including capturing Carthage and ending Roman power in the region after 850 years. Sergius reconciled the Church of Aquileia to Rome. Ordered processions in Rome on the days of the Annunciation, Nativity, Assumption of the Blessed Virgin, and Purification. Sent missionaries to Friesland and Germany. 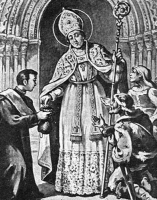 Defended Saint Wilfrid of York. Baptized Caedwalla as king of the West Saxons in 689. 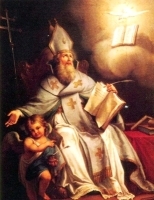 Ordained Saint Willibrand as bishop of the Frisans in 695. Introduced the Agnus Dei to the Latin eucharistic rites. Ordained ninety-six bishops, eighteen priests, and four deacons. Born to Jean and Marie Ozanam, the fifth of 14 children; only three of them survived to adulthood. Married layman scholar, teacher and author in the archdioceses of Paris and Marseilles, France. Studied law in Paris. Worked in the judicial service in Lyons, France. Obtained a doctorate based on his work on Dante. Taught in Lyons, Paris and the Sorbonne. His writing and teaching always revolved around the benefits to individuals and society of Christianity. One of the founders of the Conference of Charity which became the modern Society of Saint Vincent de Paul. Son of Saint Nerses the Great, Catholicos of Armenia. Studied at Constantinople. Married layman for several years. Widower. Monk. Catholicos of Armenia in 390, succeeding his father to the office. He secured recognition from Constantinople of the status, rights and independence of the Armenian Church. From his position he worked to reform the Armenian Church, evangelize the Armenian people, and establish an Armenian identity. He enforced Byzantine canon law, insisted on celibacy for bishops, built churches, schools and monasteries, and fought Persian paganism. Isaac worked with Saint Mesrop the Teacher to evangelize Armenia, and to develop and alphabet of the Armenian language. He supported the translation the Bible and the Greek and Syrian Doctors of the Church into Armenian Isaac served as both civil and religious ruler of his people, established a national liturgy, and was responsible for the beginnings of Armenian literature. He was driven into retirement in 428 when the Persians conquered part of his territory, but later returned as Catholicos at Ashtishat from where he worked until he death. Considered the founder of the Armenian Church. Daughter of Cattarina Colonna amd Count Guido Antonio of Montefeltro of Urbino. Orphaned as a child, she grew up in the Roman villa of her uncle, Prince Colonna. Married to Duke Alexander Sforza, Lord of Pesaro, Italy at age 16 in 1448. After several happy years together, Alexander began to lead a dissolute life. He fell for a woman named Pacifica, had an affair, tried to poison Sueva, and finally kicked her out of the house in 1457. She joined the Poor Clares at Pesaro, taking the name Seraphina, and spending much of her time praying for Alexander's conversion. He eventually came to his senses and wanted Sueva back, but by then she had taken her vows. Twenty years a nun, she was elected abbess of her convent in 1475. One of eleven children in a pious family. Joined the Carmelite Sisters of Charity on 16 July 1886. Studied at the college in Madrid, Spain. Taught at the college of Trujillo. Superior of the community of Villafranca de los Barros, Badajoz, and in Seville, Spain. Elected Superior-General of her Order in 1923; she served for 13 years during which the Order founded 20 new communities, and Apolonia worked for the beatification of their founder, Saint Joaquina Vedruna Vidal de Mas. Martyred in the Spanish Civil War. Priest. May have been a bishop in Ireland. A would-be reformer who, when he received little help from his brother clerics, migrated c.653 with several friends from Ireland to the Nahe Valley near Bingen, Germany. Founded the monastery of Mount Disibod; the nearby city of Disenberg (Disibodenberg) is named for this house. Bishop of Disenberg, Germany, governing in the Irish way, as abbot-bishop, living as an anchorite in a bee-hive cell. He won many converts in the region. Reported miracle worker. Saint Hildegard of Bingen wrote of biography of him based on visions she received. This feast probably originated after the Council of Ephesus in 431, which established her right to the title of "Mother of God." It was first mentioned in a hymn composed by Saint Romanus, an ecclesiastical lyrist of the Greek Church; adopted by the Roman Church in the 17th century. Born to a pious, hard-working family, Pascual was baptized at the age of one day. Joined the Franciscan Friar Minor novitiate at age 12, making his solemn profession on 24 January 1909. Studied theology at the Franciscan school in Onteniente, Spain, and was ordained on 15 August 1913 in Teruel, Spain. Teacher. Spent four years as a parish priest in Argentina. Returning to Spain he taught novices. Vicar of novices at Vest-Valencia in 1931. Martyred in the Spanish Civil War. Raised in a pious family, and always known as an excellent student. Began studying at the Franciscan minor seminary in Benisa, Spain at age 12. Became a Franciscan Friar Minor on 3 October 1910, taking the name Plácido and making his solemn profession on 10 November 1914. He continued his studies in Valencia, Spain, and was ordained on 21 September 1918. Studied at the Faculty of Law of the Antonianum in Rome, Italy. Taught theology at the Franciscan school in Onteniente, Spain. Served as superior of his house and rector of the college. Martyred in the Spanish Civil War. Baptized on the day of his birth and confirmed on 8 August 1902, all in his parish church of Santa Maria in the archdiocese of Valencia, Spain. A lifelong layman, he worked at a bank, served as a catechist, and was married to Julia Jordá Llovet on 26 September 1913. Father of five. Member of Catholic Action, the Society of Saint Vincent de Paul, the Apostleship of Prayer; Franciscan tertiary, he spent his Sunday afternoons helping the sisters care for the sick at the local hospital. During the Spanish Civil War he prevented the fire-bombing of his parish church which led to his imprisonment and execution by the anti-Christian forces. Martyr. Franciscan Friar Minor, making his solemn profession on 5 July 1936, just days before the outbreak of the Spanish Civil War. He had been studying theology; his family urged him to give it up and become a teacher, in hopes of avoiding the persecutions of the anti-Catholic Republican forces. He refused and was soon arrested, told to deny God, and then killed when he refused to do so. Martyr. One 6 January in the late 12th century, villagers from Meritxell, Andorra were going to Mass in Canillo. Though it was winter, they found a wild rose in bloom by the roadside. At its base was a statue of the Virgin and Child. They placed the statue in a chapel in the church in Canillo. The next day the statue was found sitting under the wild rose again. Villagers from Encamp took the statue to their church, but the next day the statue had returned to the rose bush. Though it was snowing, an area the size of a chapel was completely bare, and the villagers of Meritxell took this to mean that they should build a chapel to house the statue, and so they did. On 8-9 September 1972 the chapel burned down and the statue was destroyed; a copy now sits in the new Meritxell Chapel. Joined the Dominicans c.1440. Noted theologian, philosophers, scholar, and writer. Studied in Paris, France. Taught at Paris; Lille, France; Douay, France; Ghent, Belgium; and Rostock, Germany from 1459 to 1475. By his preaching he restored the devotion of the Rosary throughout northern France and the Low Countries, and he established many Rosary confraternities. His writings were published posthumously. Priest. Member of the Congregation of Saint Michael the Archangel. During the Nazi persecutions of World War II he was imprisoned in a concentration camp, set to forced labour in a stone quarry, and eventually murdered. Martyr. Seminarian at Rheims, France, and at Valladolid, Spain. Ordained in 1596. Returned to England to minister to covert Catholics in the north. Arrested almost immediately, but managed to escape. Arrested again, he was condemned for the crime of priesthood. Marytr. Born a princess, the daughter of King Saint Ethelbert of Kent (part of modern England). Married to King Edwin of Northumbria (also part of modern England). Friend of Saint Paulinus of York. Widow. After Edwin's death, Ethelburgh returned to Kent, founded the convent in Lyminge, entered it as a nun, and then served as abbess. Jesuit priest. Missionary near Kosice, Hungary (in modern Slovakia). Arrested by Calvinist troops in 1619, tortured and executed for loyalty to Catholicism. Martyr. Born a princess, the daughter of King Robert the Pious of France. Sister of Henry I. Married to Count Baldwin IV of Flanders. Mother of Baldwin VI. Mother-in-law of William the Conqueror. Widowed in 1036. Benedictine nun, receiving the veil from Pope Alexander II. She retired to a quiet, prayerful life at Messines convent near Ypres, Belgium. Married layman in the apostolic vicariate of England during a period of government persecution of Catholics. Martyr. Priest. 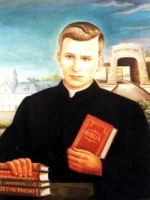 One of the 108 Polish Martyrs of World War II. Priest in the Haute Loire region of France. Founded a monastery for Augustinian canons at Pebrac, Auvergne, France. Assigned to reform several Augustinian cathedral chapeters. Scottish chieftain. Lived in Wales. Several churches dedicated to him. A group of Christians martyred together in the persecutions of Diocletian - Ammon, Dio, Faustus, Neoterius and Theophilus. A group of 21 missionaries and converts who were executed together for their faith.